The Agri-activism campaign for Food and Agriculture is asking people to visit their local supermarkets, fill their baskets and trolleys with weed-killers that contain glyphosate, and ask to see the manager. The store managers should be politely informed that glyphosate seriously damages human health and asked to remove the products from their shelves, or at least to post a sign warning shoppers that the World Health Organisation has found glyphosate to be ‘probably carcinogenic to humans’. California has gone one step further and has ruled that glyphosate products must be labelled ‘known to cause cancer’. Glyphosate was first used as a weedkiller by Monsanto in the 1970s in Roundup, now the most widely used herbicide in the world . It is regularly sprayed in agriculture on crops and on grass, and in public parks, gardens, children’s playgrounds and pedestrian pavements. The Agri-Activism campaign asks volunteers to hand a letter to the supermarket managers informing them of some of the reported possible links to rises in cancer, autism, Alzheimer’s, birth defects, brain cancer, liver and kidney damage among other diseases and conditions  and asking them if it is appropriate to be selling it in a store that also sells food. 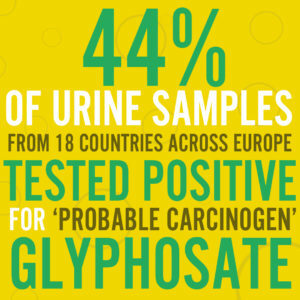 Glyphosate was found in 7 out of 10 urine samples in the UK, and in the breast milk of 30% of women tested in a recent US survey . A European Citizens Initiative demanding a total ban on glyphosate in the EU was signed by over 1.3 million people and delivered to member states in July 2017. In our 6 September action in two supermarkets, Tesco and Poundland, managers listened to our concerns about glyphosate products. The Poundland manager said he would send the letter to head office and promised he would make sure it was read; the Tesco manager said that “we’d need to send it ourselves”. In the EU, Glyphosate has been approved for use up to the end of 2017. The Commission proposes to renew the license for a further ten years, relying on a report by the European Food Safety Authority (EFSA) that says that it is unlikely to cause cancer in humans, and recommends the license is renewed . However, the EFSA report, contains whole paragraphs copied and pasted from a pro-glyphosate report, authored by a Monsanto employee and an ex-employee, which denies the link between glyphosate and cancer. 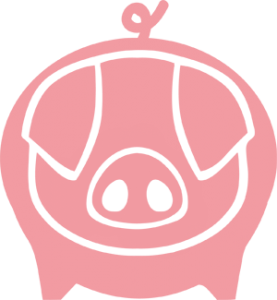 Greenpeace called the EFSA’s report ‘a whitewash’ . 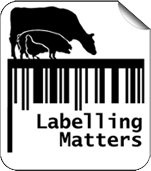 The European Commissioner for Health and Food Safety has said that the license will not be renewed without approval from a ‘qualified majority’ of member states. This means that 16 of 28 member states must vote in favour of renewal and the support must come from countries representing at least 65 percent of the EU population. Monsanto and other glyphosate producers are lobbying hard for the license to be renewed, so please use your networks as widely as possible to ensure that politicians vote against renewing the glyphosate license. 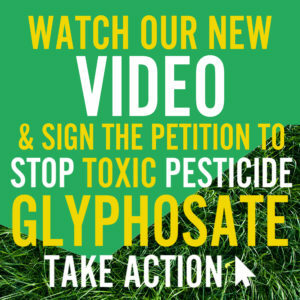 Join over 1 million others & sign the Petition demanding a total ban on the use of glyphosate in the EU. Watch and share our Supermarket action videos. Stage your own super store action! See our lobbying instructions. Follow the hashtags #glyphosate & #stopglyphosate for information from other organisations who are lobbying against the use of glyphosate.